I’m working my way through a serious case of starter-itis with my knitting. There are so many great patterns. I’m spending far too much time scouring the inter-webs for new ones, not to mention all the ones I already had in my queue. Every time I finish a really big knitted thing I start this panicked need interest to have another big project on the needles. and a searching I will go. The starter-iris is not calmed by having new yarns to admire, and pet, and sniff, and cuddle, and KNIT! I added knew skeins last week and this week I’ve placed another order as well as a preorder. I really need to reign it in, I’m a bit out of control. 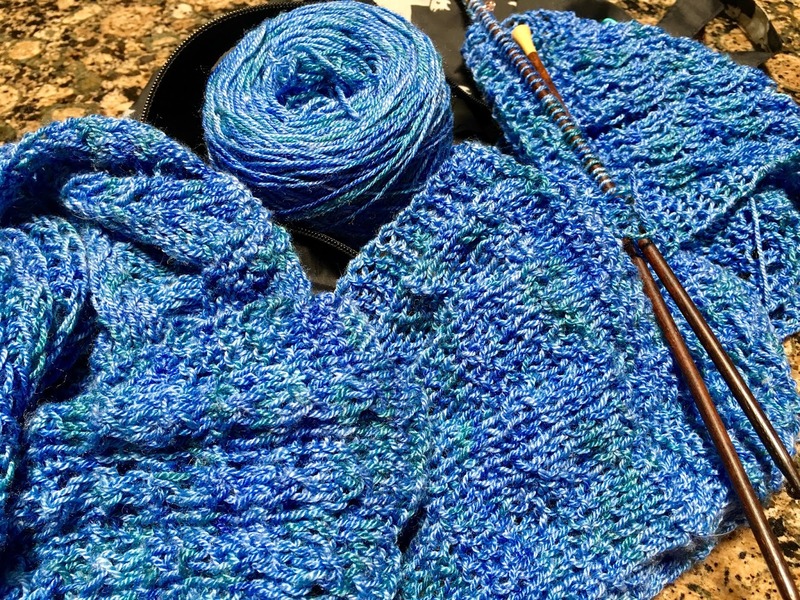 And, I blame think having used 7 skeins of my hoarded Wollmeise for the Find Your Fade shawl by Andrea Mowry that everyone (including myself and several of my friends) seems to making right now, created a definite shortage that had to be rectified! 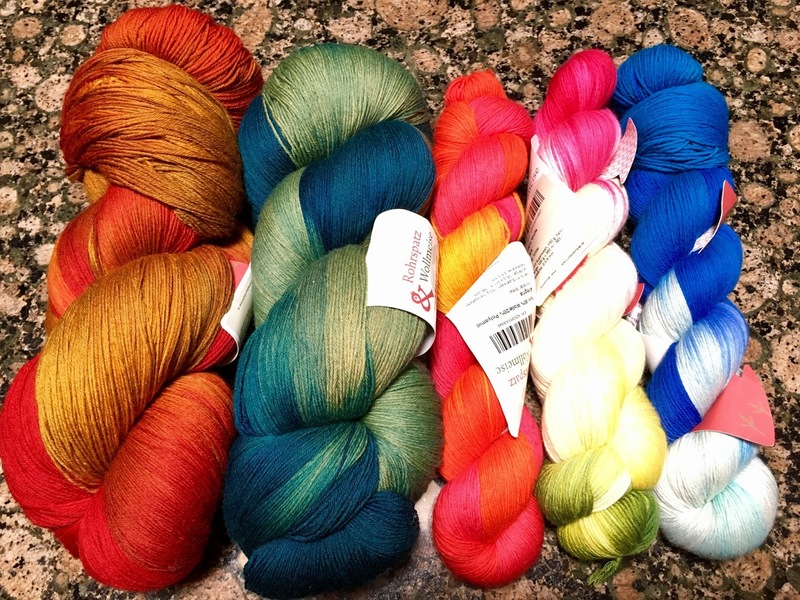 So….I’ve picked up several skeins of Wollmeise from The Loopy Ewe and a few more not pictured. DON’T TELL! my usual style. But this yarn was completely wrong!! This stayed in thought process for less than 24 hours. I knew I hated the combo. 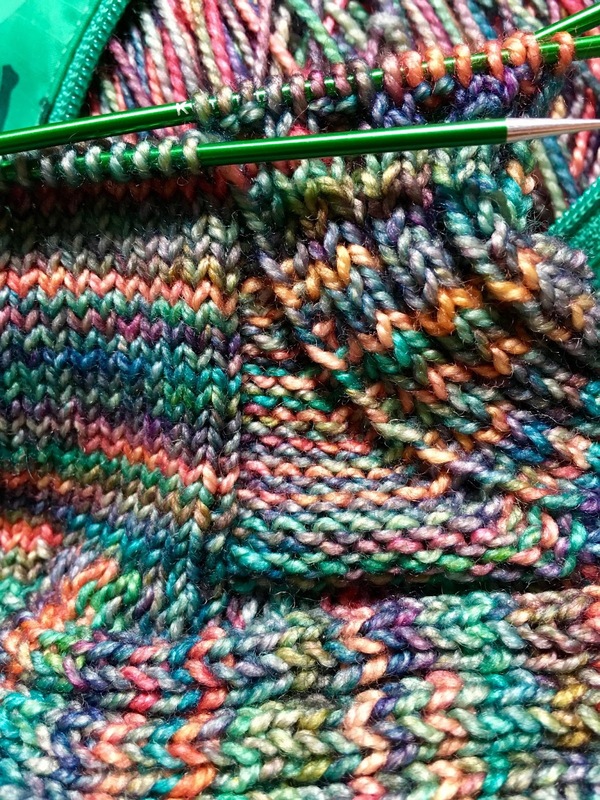 So, I frogged it, and restarted another project with the yarn and ordered different yarn from Knitpicks to try this pattern again. For the new project I started the Match & Move by Martina Behm. I made a slight adjustment using a yarn over for the increase instead of Knit into the Front and Back. 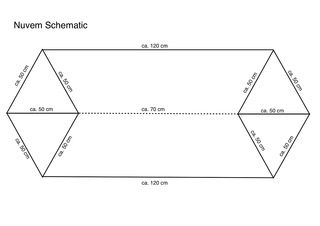 I debated about adding a lace section similar to the Free your Fade by Andrea Mowry. In the end I decided to just stick with the garter stitch. It will be good Game of Thrones knitting!!! I like so many of Martina’s patterns. 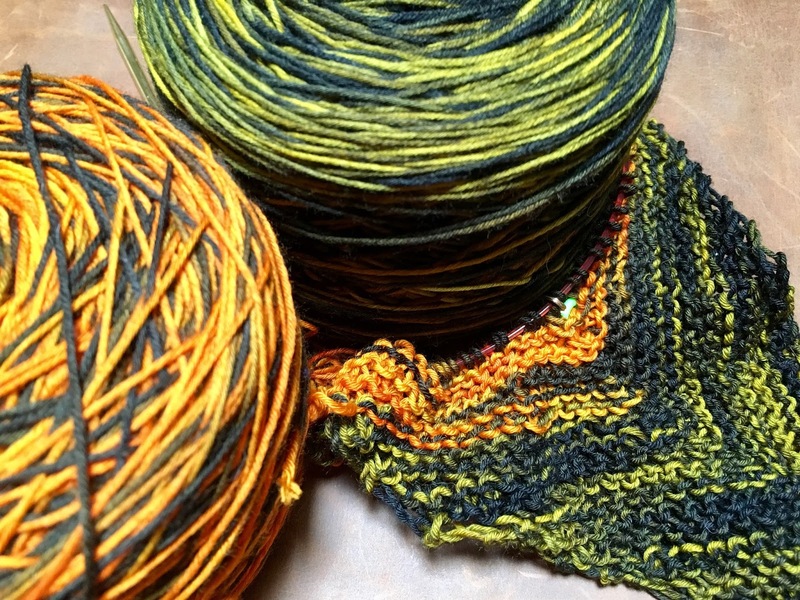 The Nevum is one of the most worn shawls that I’ve knit. 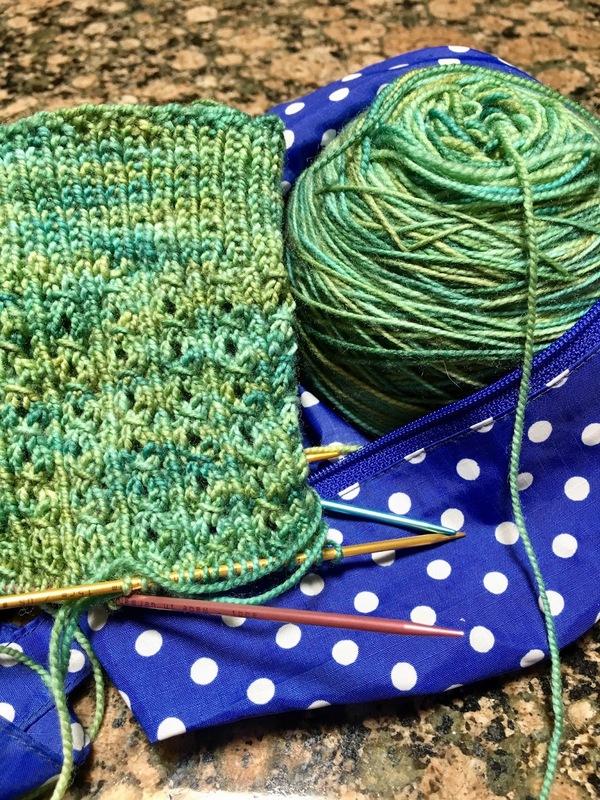 I knit it with a teal color Wollmeise Lace quite awhile ago and plan to knit it again with the Orient I just purchased. I love the way the Nuvem sits on the shoulders, the unusual shape is like a rectangle with corners tucked into the short ends. The ruffled edge is charming and feminine while not being fussy. I have several other projects going now, too. I have two pairs of socks, and a scarf that I’m working on in conjunction with my classes. Usually I like to have 3 projects. Socks for on the go, a complex pattern to challenge my mind and a interesting but simple TV watching project. I volunteer at the local Senior Circle. It is organized and ran by the hospital, Mountainview Regional, here in Las Cruces. I have a class twice a week, it is an independent study style class. Everyone is welcome to work on any project and if they run into trouble or simply don’t know how to find and fix their mistakes, I help. I try to teach not only how to locate the mistake but how to fix it as well, not to just fix it for them. I have seen much growth from this style class and think it is really special. In addition to working on whatever they like we have a sampler scarf going. I have written out different stitch patterns with a mind to learning new techniques and stitches. Each section is bordered with garter stitch, this enables the adjustment of stitch counts for the patterns to be made without showing. The garter stitches also act as a frame, giving a nice cohesive look. I can’t remember the actual yarn, the label is long gone. For my current On the Go Sock I’m using my Basic Sock Pattern. I added a few things for some flare. I will add more info on a future post about that flare! Here’s a sneak peek. The Last project on my needles is also a sock. This one is Kym’s Birthday Socks. 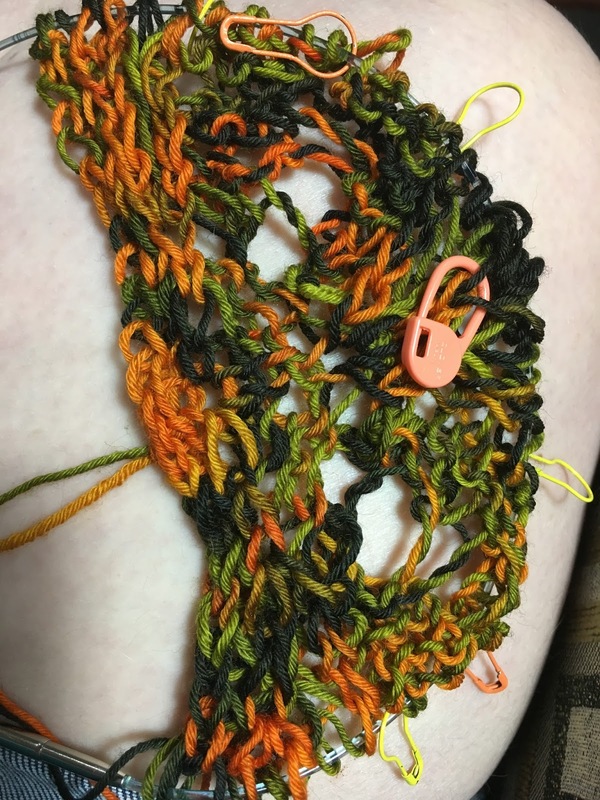 I used one of my favorite stitch patterns, rewrote it so it worked in the round and created the sock pattern from there. I really like the results. I find I did have to go up a needle size from my usual #1 to a #1.5. Whew, that was a lot! I have so many more things swirling around in my head though…..another day.